For years now, I've been wanting to learn to bake bread, yeast bread to be specific. I had a bread machine for a while and I enjoyed the bread it produced. But, baking it was basically following directions on how to add the ingredients, pressing a few buttons, and then waiting...Whenever I would read a recipe for yeast bread, I would cringe. The list of directions just seemed so long: proofing, mixing, kneading, covering, rising, punching, rising, and, finally, baking. Did I really want to get involved with this operation? So, when I got the opportunity to review a cookbook on baking bread, I though that this was opportunity I had been looking for, the push I needed to conquer my fear and learn to bake bread. This cookbook was the perfect baking cookbook for a beginning bread baker like myself. First of all, the book has tons of photos, photos that assisted me when I worked on my focaccia. I was able to see step-by-step the process of making the dough. I knew what each step was supposed to look like. I didn't have to rely on my interpretation of the written directions. Years ago, there was a restaurant in Savannah, Georgia called Orleans. My husband and I ate there many times. Whenever we ordered a pasta dish, it was accompanied by a big chunk of focaccia. That was my first experience eating focaccia and I loved it. I looked forward to that piece of bread every time I went. We would even order an appetizer of focaccia that would come out with a cup of marinara. Unfortunately, the restaurant went out of business years ago and I've never forgotten how much I loved the bread. 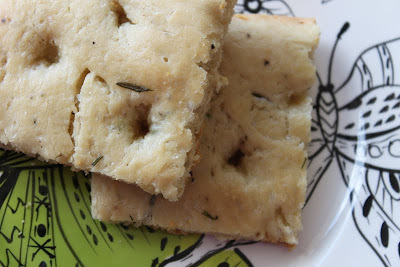 It was quite empowering to make this rosemary focaccia at home. The scent of the rosemary was reminiscent of our dinners at Orleans. I'll admit that I made a major mistake when I was making the dough. I misread the amount of yeast needed and used three tablespoons instead of three teaspoons. It created a hard, crunchy bread but it had unbelieveable flavor that took me back to date night at Orleans. My husband enjoyed the bread despite the texture. I know it was a rookie mistake and one I didn't realize I made until the next day when I worked on the blackberry focaccia and the lightbulb went off. No wonder!?! But, I made up for my earlier mistake when I made this blackberry focaccia. It had a beautiful texture. The blackberries were a little tart for my taste but the bread itself was wonderful! I'm going to make the recipe again using blueberries or peaches. I can't wait to taste the variations! Rising and Proofing Time: 1-1/2 - 2 1/4 hrs. 1. In a small bowl, sprinkle the yeast over 4 tbsp. lukewarm water. Let stand for 5 minutes until dissolved, stirring once. 2. In a large bowl, mix the flour with the salt and 2 tbsp. of the sugar. Make a well in the center and add the dissolved yeast, 4 tbsp. of the oil, and 1 cup of lukewarm warm. Draw in the flour and mix to form a smooth dough. The dough should be soft and sticky; avoid adding more flour to dry it out. 3. Flour your hands and the dough, and turn it out onto a floured surface. Knead for 5-7 minutes, until smooth and elastic. Transfer to an oiled bowl and cover with a damp kitchen towel. Leave to rise in a warm place until doubled in bulk; about 1 to 1-1/2 hours. 4. Generously brush the pan with olive oil. Turn out the dough and knock out the air. Cover with a dry kitchen towel and leave to rest for 5 minutes. Transfer to the pan, flattening with your hands to fill it. 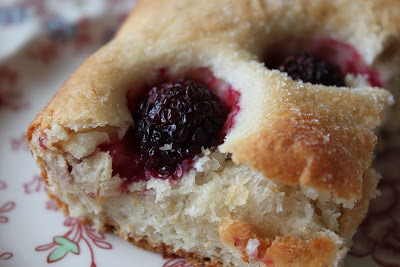 Scatter the blackberries over the surface of the dough, cover, and leave to rise in a warm place for 35-45 minutes, until puffed. 5. Preheat the oven to 400 degrees. Brush the dough with the remaining oil and sprinkle with the rest of the sugar. Bake in the top of the oven for 15-20 minutes, until lightly browned. Cool slightly on a wire rack, then serve warm. love the look of this bread,, what would you eat it with?